Fourth generation herbalist and nutritionist Marc Ching and owner of the PetStaurant has teamed up with Rescue Pet Foods to create dog treats with supplemental support. Available in two varieties including Allergy Support and Immune Support, these probiotics are essential for a healthy lifestyle, and the snacks are both a supplement and a treat! 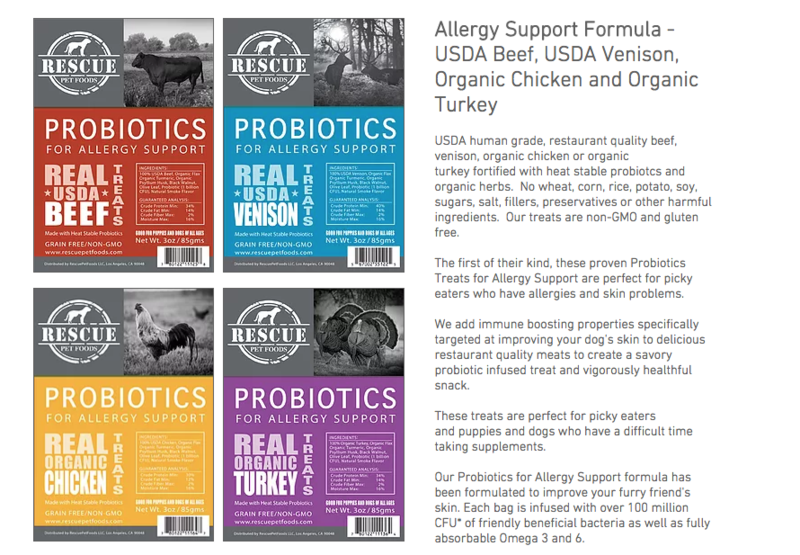 Both formulas feature USDA human grade, restaurant quality beef, venison, organic chicken or organic turkey fortified with heat stable probiotics and organic herbs. No wheat, corn, rice, potato, soy, sugars, salt, fillers, preservatives or other harmful ingredients. The treats are non-GMO and gluten free. 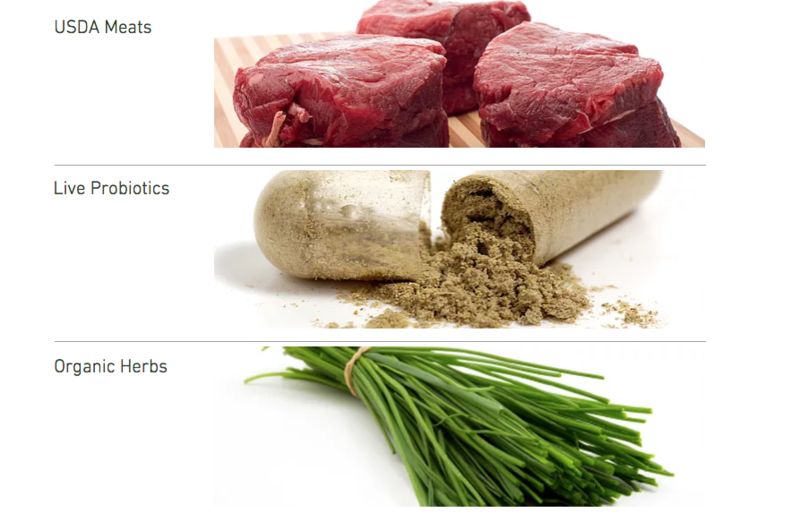 “We’ve added immune boosting properties specifically targeted at improving your dog’s health and resistance to illness with delicious restaurant quality meats to create a savory probiotic infused treat and vigorously healthful snack,” says Marc. Additionally, the treats have been formulated to improve your furry friend’s skin. Each bag is infused with over 100 million CFU* of friendly beneficial bacteria as well as fully absorbable Omega 3 and 6. Recommended by Veterinarians and Animal Nutritionists across the U.S., probiotics work to boost the immune system and help fight off immune invaders that can cause inflammation and other health issues. The first of their kind, these proven Probiotic Treats are perfect for picky eaters who have allergies and skin problems or need added immune boosting benefits. There are many reasons to embrace the hydroponically grown, dirt-free grass in Fresh Patch. Take me for example. I have a new dog, I live in an apartment and he needs to get his grass on when I’m not home, while he house trains! 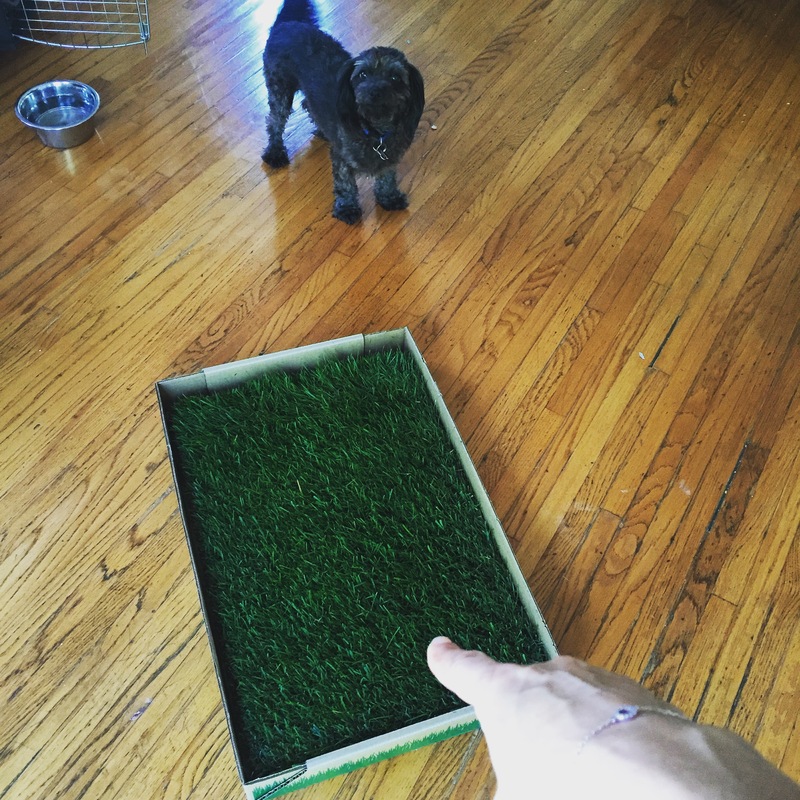 These real grass training pads are all-natural, and dogs instinctively want to go on real grass, so training is easy. The living grass absorbs liquids and controls odors naturally, turning puppy potty training into a cleaner, more hassle-free process than ever. YAY! There is no cleaning or maintenance needed because the entire unit is fully disposable. And you can order it to arrive as often as you need with their continuous Fresh Patch delivery service. All you have to do is replace your discarded unit with a new one as soon as it arrives at your doorstep! The Fresh Patch Standard is 16″ x 24″ inches and is designed for pets who weigh less than 25 lbs. Fully disposable with no parts to clean — simply dispose of the entire unit when a new one arrives at your doorstep. The standard Fresh Patch (16″ x 24″ inches) is recommended for pets less than 25 lbs. The standard Fresh Patch combines living grass and a disposable container in a completely disposable and replaceable unit. When the package arrives simply remove the lid and place the product where you want your pet to go. 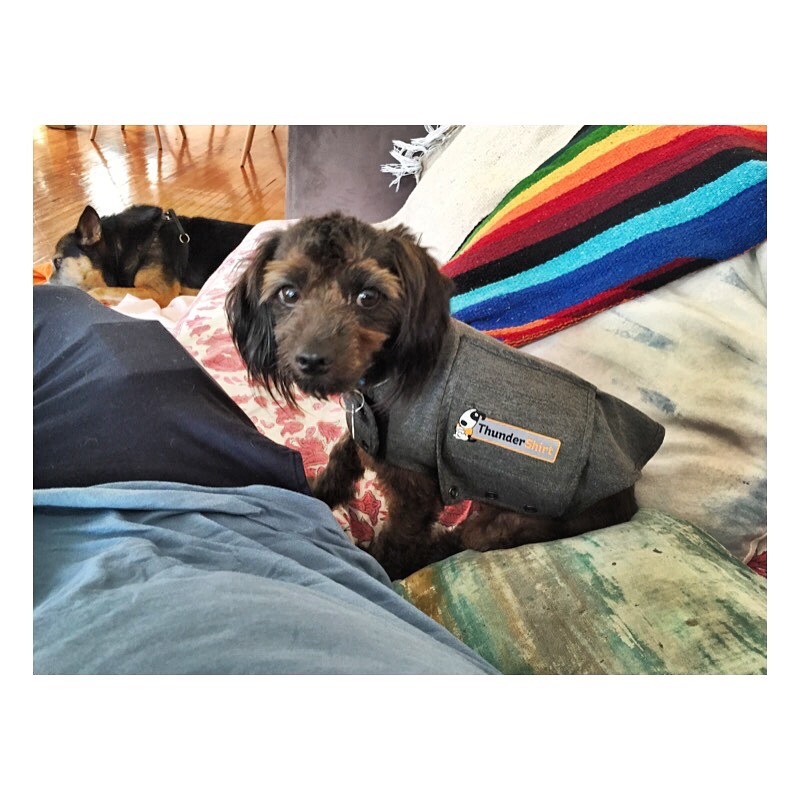 The Fresh Patch XL (2′ x 4′ feet) is recommended for pets more than 25 lbs and for multi-pet households. The Fresh Patch XL comes rolled up in a box — It does not come with a functional tray (we recommend purchasing one of our custom trays). It’s recommended to replace your Fresh Patch every 1-4 weeks depending on the size of your pet and how frequently the product is being used. They offer plans for delivery every week, every (2) weeks, every (3) weeks and every (4) weeks. Switching between plans is easy once you setup an account! The grass used in Fresh Patch is grown hydroponically (without the use of soil). The absorbent pads of living grass are lighter, cleaner, and last much longer than normal sod. They utilize several different kinds of grass including rye, blue, fescue, zoysia and bermuda. Most dogs get the hang of Fresh Patch immediately. Please visit the training page for some helpful troubleshooting tips and give them a call (1-800-783-7109) so that they can listen to your specific situation and offer advice. Caryl Wolff, CPDT, NADOI, CDBC, owns and operates Doggie Manners and teaches classes and private lessons in obedience, manners, agility, and tricks throughout the Greater Los Angeles area. 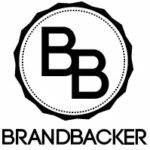 She is certified or endorsed by multiple dog trainer organizations – the Certification Council for Professional Dog Trainers, the National Association of Dog Obedience Instructors, and the International Association of Animal Behavior Consultants. The new Pyle Audio® Doggy Fun is an automatic dog ball launcher with ball return bin ideal, for playing and training pets. Doggy Fun will allow busy dog lovers and their animals to exercise, while training the fundamentals of playing fetch both indoors and out. I cannot wait to try this on my new pup!! Doggy Fun uses small (1.5 inches in diameter), soft tennis balls guarantees safety for your dog and are easy for any small to medium dog to fetch. 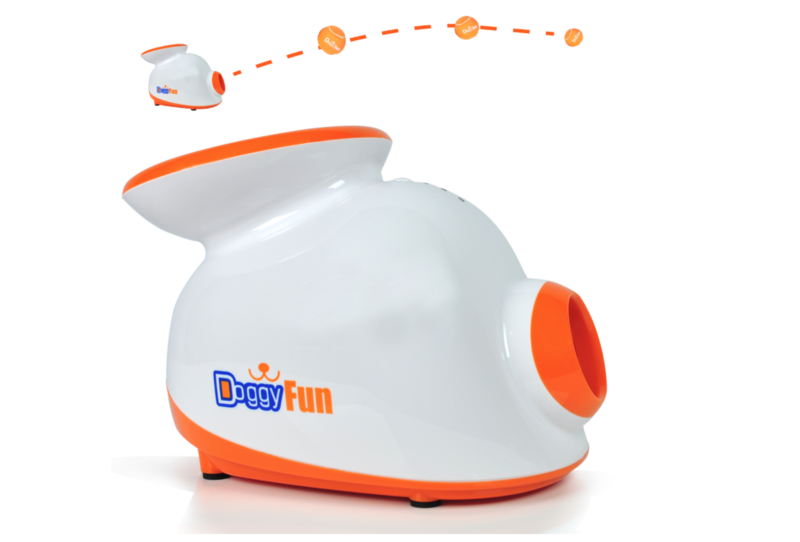 Doggy Fun can train your dog to retrieve balls and drop them into the funnel, which causes the machine to shoot them out again. This provides the dog with endless amounts of independent play, regardless if the owner is home or free to play. The launcher has three different settings that launches the balls distances of up to 10, 20, or 30 feet. The plug and play Doggy Fun includes three mini tennis balls, and is available now for $99.99 at Pyleusa.com. With more than 40 years’ experience in the manufacturing of high-quality audio products, Pyle has established itself as a premier source for car audio, home audio and professional audio and musical instruments. Product lines include Pyle Pro, Pyle Car and Pyle Home. The company has recently expanded into outdoor recreational gear with its Pyle Sports line. For more information, please visit www.PyleUSA.com. How many times have you walked your dog or let him run around the yard, only to find that he comes back to the house dirty and smelly? We would love to introduce you to Just 4 Fur. Just 4 Fur’s mission is directed towards improving the pet-consumer experience and making pet products more exciting. Not only can you use the products on your pet, but you can also use them on yourself. No more separate bottles for you and your pet– now you can even shower together, save water, save the extra trip to the store and save on product! The human grade formula has been tested on both humans and pets. The sulfate-free, hypoallergenic, non-GMO ingredients found in the product allow both you and your pet to lead healthier and happier lives together. Warren’s shiny coat smelled like a fresh pina colada after a bath in the sweet smelling Pineapple shampoo. Lucy groomed and ready for a night out after a quick soak in the Sea Cucumber shampoo. We also gave them a squirt of the deodorizing spray when they were dry, because…why not? It’s safe, effective and smells amazing! Aharon Adouth states he created Just 4 Fur because, “This is a marketplace where I know I can make an impact. 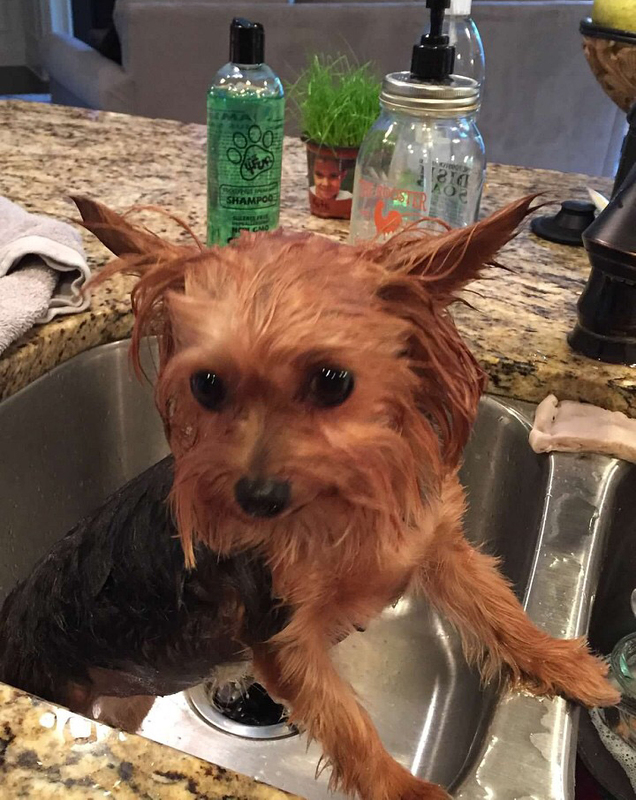 Everything in pets and the pet accessory world is so generic that I think I can really revolutionize the way people treat, interact, and see their pets simply by bathing, clothing, and grooming them a little bit more personally. Pets are family, and its time they start getting treated a little bit more like it!” Items range from Shampoos to Deodorizing Sprays and scents include Chamomile Lavender, Sea Cucumber, Cherry Blossom, Pineapple, and Eucalyptus Spearmint. All scents come in shampoo accompanied by the spray to ensure that the delicious smell lasts as long as it can. The product is not only the best smelling shampoo and spray on the market, but will also leave your furry friend with a gorgeous new coat. Aharon Adouth founded Just 4 Fur in 2015 when he was asked by a family member to adopt a dog, that due to unfortunate circumstances, he could no longer keep himself. Being the animal lover that he is, he could not say no. 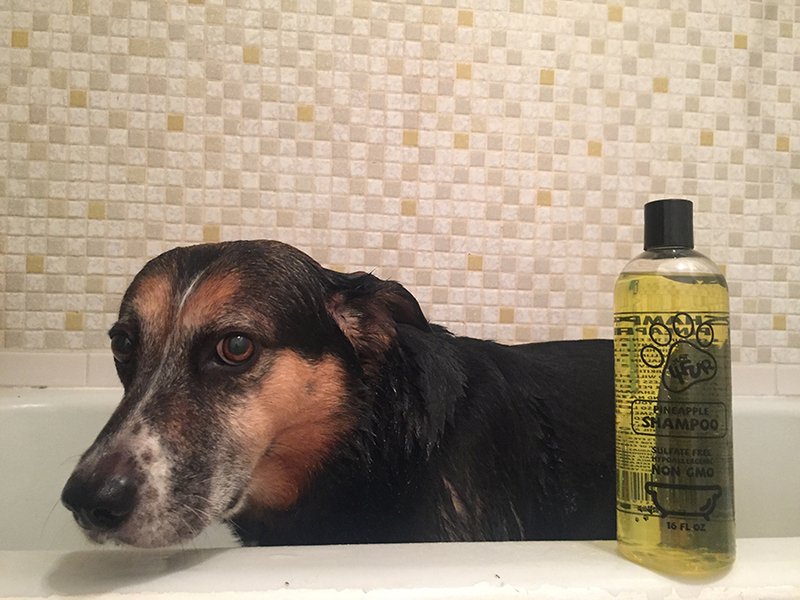 There began the journey that led to the creation of Just 4 Fur shampoos and scents. When Aharon came to pick up his new pet, the dog had multiple health problems including eye and skin infections, just to name a few. These infections were easily treated with antibiotics, but the skin infection and smell that came with it were hard to live with. After trying many shampoos on the market and failing to find one that was soothing enough, Aharon realized there was a gaping hole in the pet market that needed to be filled. He the set out to fill that hole, so others would not have the same problem. Today Just 4 Fur’s 5 shampoo scents and spray colognes fill that gap. 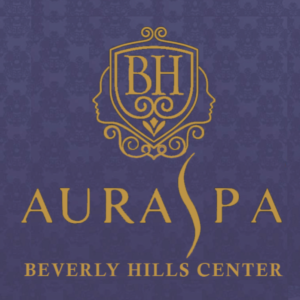 All Just 4 Fur products are sulfate free, hypoallergenic, non-GMO and are proudly made locally in Miami, Florida.